I thought it would be a slow news week this week because of the Thanksgiving holiday, but thanks to the stellar students at Yavneh Academy, I have lots of good news to report. Congratulations to Yavneh Academy’s The Bulldog Print, which was awarded the “Best in Show” for broadsheet, 13- to 16-page newspapers at the 2012 National High School Journalism Convention, sponsored by the National Scholastic Press Association and the Journalism Education Association. The convention took place Nov. 15-18 in San Antonio, with more than 5,000 students from 500 schools attending. The Bulldog Print team comprises editor-in-chief, Siegel; editor, Herson; layout editor, junior Dalya Romaner; graphics editor, sophomore Scott Lacritz; advertising editor, junior Adam Steinbrecher; photo editor, sophomore Erin Smith; news editor, sophomore Hannah Delagi; features editor, sophomore Taylor Blue; perspectives editor, Goodman; sports editor, junior Jason Epstein; and entertainment editor, senior Hannah Gartner. Also, reporters freshman Amitai Abouzaglo, junior Shanee Abouzaglo, junior Niv Avneri, sophomore Cassie Gross, sophomore Alexandra Lavi, senior Katie Lerer, freshman Mitchell Levinson, junior Hanna Liebermann, sophomore Ethan Pearson, junior David Rudomin, senior Mika Stein and freshman Erin Wernick. “This recognition comes as a result of our in-depth reporting, quality writing, action-packed photos and skillful design, and I am now reminded of how lucky I am to be a part of the Bulldog Print staff,” Siegel said after the convention. “Sitting in workshops, composing articles during timed writing competitions and meeting other aspiring journalists from around the country, I realized how unique our staff and publication are. Under adviser Sandy Hall-Chiles’ tutelage, The Bulldog Print has also won many national, state and local awards, including two Silver Crown awards from the Columbia Scholastic Press Association, a Pacemaker Award from the NSPA and six Silver Star Awards from Texas’ Interscholastic Press Association. It was named Best High School Newspaper by The Dallas Morning News. The paper’s writers have won many individual awards for production, writing, and layout design. Yavneh junior Shanee Abouzaglo was recognized by the Southwest Region of the National Council of Synagogue Youth for her leadership, passion and commitment to the Jewish Teens of Dallas. She is the daughter of Gianina and Shimon Abouzaglo and a graduate of Akiba Academy. Also, senior Kayley Romick stood center stage at the Nov. 15 gathering of the WordSpace Salon, a non-profit North Texas literary organization dedicated to supporting indigenous literature. Romick presented six of her own original poems. A finalist in the 2010-2011 and 2011-2012 Express Yourself! Youth Poetry Competition, sponsored by the Dallas Public Library, Romick’s appearance was part of an evening that featured author Matt Bondurant (“The Night Swimmer,” “The Wettest County in the World” and “The Third Translation”). 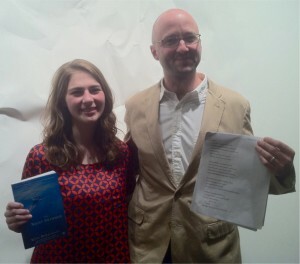 Romick, at the end of the evening, exchanged a signed copy of Bondurant’s book for a copy of her own poetry portfolio. Romick autographed her portfolio at Bondurant’s request. She is the daughter of Shani and Jeff Romick of Plano and a graduate of Ann and Nate Levine Academy. 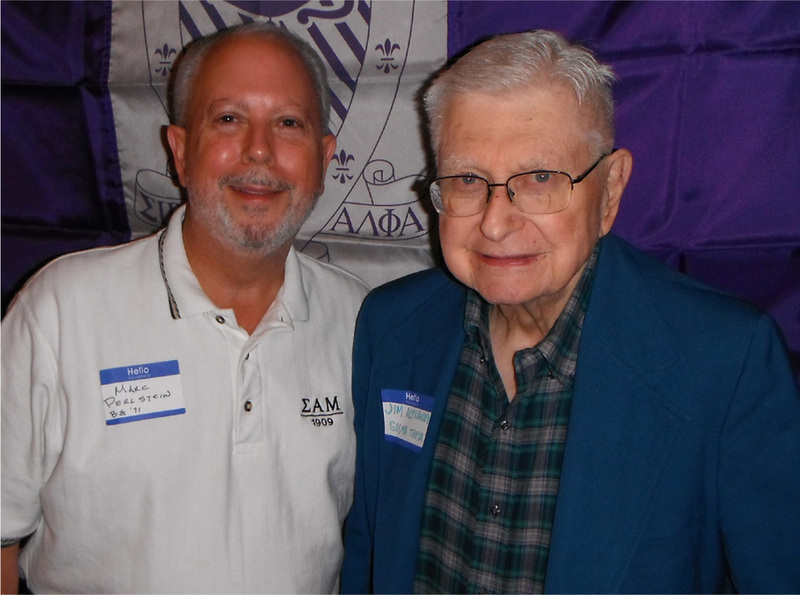 Local lawyer James R. “Jimmy” Alexander was honored for his decades of volunteer service to the Sigma Alpha Mu fraternity during a November gathering of Dallas-area alumni of the group. Fraternity national president Marc Perlstein, also of Dallas, presented Alexander with a certificate of appreciation for his unwavering efforts to support and develop the organization. Alexander, who was born in Cleveland, was initiated into the fraternity’s SMU chapter in 1941. Two years later, the fraternity’s national magazine, The Octagonian, identified him as a “Man of Promise” in recognition of his two terms as president of his chapter and for being the first president of the SMU Hillel. While pursuing his law degree at the University of Texas, Alexander became even more active as an alumnus. Since then, he has gone on to serve Sigma Alpha Mu in numerous roles at the local, regional and national level. 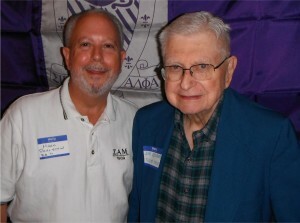 Alexander has also endowed two scholarships for students through the Sigma Alpha Mu Foundation. In 2009, he was the recipient of the fraternity’s “Distinguished Service Award,” an honor bestowed sparingly in the national organization’s 100-plus year history. Sigma Alpha Mu was founded in 1909 at the College of the City of New York as a fraternity of Jewish men. Today, it has undergraduate chapters on 50 campuses across North America and more than 64,000 men initiated since its founding. “Black Friday” is behind us and Chanukah is ahead. Next year, we have Chanukah and Thanksgiving at the same time. What is a shopper to do? Put tzedakah at the top of the list — what can we give to who? Make it a family project. At the Aaron Family JCC, we are collecting gifts for many needy children at the Vogel Alcove and Medical City Dallas. Start a collection: dreidels or chanukiot make great gifts. You can give a new one each year. Styles change, children grow and adults have new interests — find a chanukiah or dreidel to match. You can never have too many of either. Jewish books: Yes, you can never have too many books, either. Jewish books make great gifts and wonderful learning opportunities. Movies: Not a reader? Give a Jewish movie. The gift of Jewish summer camp: Statistics have shown that summers at a Jewish camp make for a strong Jewish identity. And start the Israel fund as well. Israel Bonds: This is the time when Israel needs us. Go to Israelbonds.com and invest in Israel — a perfect gift for all. If not a bond, how about a tree? Visit jnf.org and grow a forest. By the time you read this, Chanukah will be just more than a week away, and it may be too late for you to shop. These gifts are also great for birthdays and celebrations or just because. Laura Seymour is director of Jewish life and learning and director or camping services at the Aaron Family Jewish Community Center. 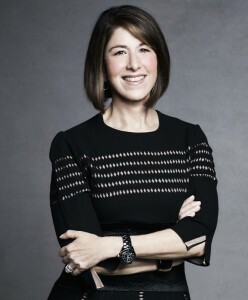 When Karen Katz took over as president and CEO of the Neiman Marcus Group in 2010, the country was coming off the recession, which hit the fashion industry hard. But her business style of building relationships with colleagues, vendors and customers and having open communication, has allowed the company to grow in the past two years. Katz believes shopping has become more emotional for people since the recession. Although the industry is doing well now, she said, people have changed their mindsets in terms of what they buy. Neiman Marcus has a long Jewish legacy in Dallas. Herbert Marcus and his sister, Carrie Marcus Neiman — part of a family that helped found Temple Emanu-El — established the first Neiman Marcus store in 1907 in Dallas. Stanley Marcus, Herbert’s son, took over the company in 1950 after his father’s death and held the position until 1972, after which he was chairman of the board for four years. “Mr. Stanley” remained a renowned figure in the Dallas area until his death in 2002. The family built the company on the foundation of three key things: presenting a beautiful product, developing relationships and giving back to the community, Katz said, knowing that Stanley Marcus was a philanthropist and a patron of the arts. It’s those key ideas that will continue to make Neiman Marcus thrive, she added. And being a face in the community also is vital, Katz said. She and Ken Downing, senior vice president and fashion director for Neiman Marcus stores, will be the guest speakers at the Dec. 11 YES! Event, which will benefit The Legacy at Preston Hollow, the Dallas Home for the Jewish Aged. Katz and Downing will share an inside view of the world of fashion and will reveal the latest fashion news in apparel, shoes and accessories for 2013. The business aspect is what really drives Katz to succeed. She has been with Neiman Marcus for 27 years and, before assuming her current role, she ran the Internet department and was president of the retail stores division. Running a strong business, while also providing customers with an extraordinary shopping experience is her ultimate goal, Katz said. The YES! Event, with the theme “The Art of Fashion: A View From the Front Row and Beyond,” will begin at noon Tuesday, Dec. 11 at the Omni Dallas Hotel, 555 S. Lamar St., in Dallas. Karen Katz and Ken Downing from Neiman Marcus will be the keynote speakers. Individual tickets are $150 each, and that price includes lunch; sponsorships are available. All money raised at the event will benefit the Legacy at Preston Hollow, the Dallas Home for the Jewish Aged. For information and to purchase tickets, call 214-363-5100 or visit www.thelegacywb.org/Preston-Hollow/theyesevent. Unless you’ve been living under a rock for about the past two weeks, you likely know Israel has been undergoing a terrible crisis, thanks to Hamas and its position in Gaza. As of this writing, the ceasefire between Gaza and Israel is still in place, but as with anything, this is day to day. If you’re truly interested in learning what’s going on in the Middle East and in Israel, I suggest you attend an update that will take place at 7 p.m. today at Congregation Ahavath Sholom, 4050 S. Hulen in Fort Worth. Gil Elan, president and CEO of Southwest Jewish Congress, will be on hand, and he brings with him impressive credentials. He’s a retired lieutenant colonel from the Israel Defense Forces and a Middle East analyst — in other words, he knows his stuff. Check out the article in the Nov. 22 edition of the TJP in which he was quoted — he provided a lot of good information about current goings-on in the Middle East. I know this event announcement is last minute, but if you are available, please attend. Debbie (Stryer) Levine writes to tell us that she and husband Larry Levine were on the go in recent weeks. First, they traveled to San Francisco, Monterrey, Carmel and Big Sur (I’m jealous — those are very pretty parts of the country). While there, the couple spent time with a college friend they hadn’t seen in close to 40 years. Following their return from the West Coast, Larry was out the door again, this time traveling to Key West, Fla., for an annual reunion with elementary school friends — and upon his return, Larry and Debbie got on a plane bound for Philadelphia (including a trip to Rehoboth Beach, Del). I’ll make my “please send me information and news” pitch midway through this column instead of at the end, as I usually do — nothing like shaking things up a little to get readers’ attention. We’re coming into that time of year during which people travel, or host guests, or have fun — or any number of things. Let me know what you’re up to. I’m grateful for folks like Debbie Levine who keep me posted on their doings, and I’m glad to see that there are weeks during which “Around the Town” is less of an activities calendar and more about what’s going on with our readers. Keep it up. Send me your activities at awsorter@yahoo.com. With Thanksgiving a recent memory, it’s time to turn our attention to Chanukah. I mentioned last week that Congregation Ahavath Sholom will host a community wide first-night-of Chanukah event at 7 p.m. Saturday, Dec. 8 at the synagogue (4050 S. Hulen). The event will feature candles to be lit by Fort Worth city officials, and the Jewish bluegrass band Lucky Break from Milwaukee will on hand for entertainment. If you plan to attend, call the office at 817-731-4721 and let JoAnn know how many tickets you’ll need. And just in case you don’t have enough of public menorah lightings in Tarrant County, Chabad of Arlington will host a second-night-of-Chanukah “Can-Orah” menorah lighting at 6 p.m., Sunday, Dec. 9 at Arlington City Hall, 101 W. Abram St.
An Arlington city official will be on hand to help light candles, and the event will feature live music and arts and crafts for the kiddos (along with latkes and doughnuts). The “Can-Orah” is a neat concept involving a menorah built from cans donated to Chabad of Arlington (it’s suggested the cans be dropped off at the shul at 2136 Linblad Court in Arlington by Dec. 7, or you can bring them with you to the event itself). After the event, the cans are donated to the Arlington Life Shelter. I attended last year’s Can-Orah lighting and it was a lot of fun — about 75 people showed up, which wasn’t bad for a weeknight. With the event on a weekend this year, more folks will likely come to celebrate. Chabad of Arlington is getting around this year — on Wednesday, Dec. 12, it will host a grand menorah lighting at its “Chanukah on Ice” event, which will take place from 4-6 p.m. at Ice at the Parks, 3815 S. Cooper St. in Arlington. Ice skating, Chanukah music, latkes, doughnuts, hot chocolate and dreidels will be in abundance. The cost is $10 per person (and includes skate rentals) — $40 maximum for families. RSVPs are essential for this event — you can either let them know you’re coming by calling 817-451-1171 or emailing info@arlingtonchabad.org. 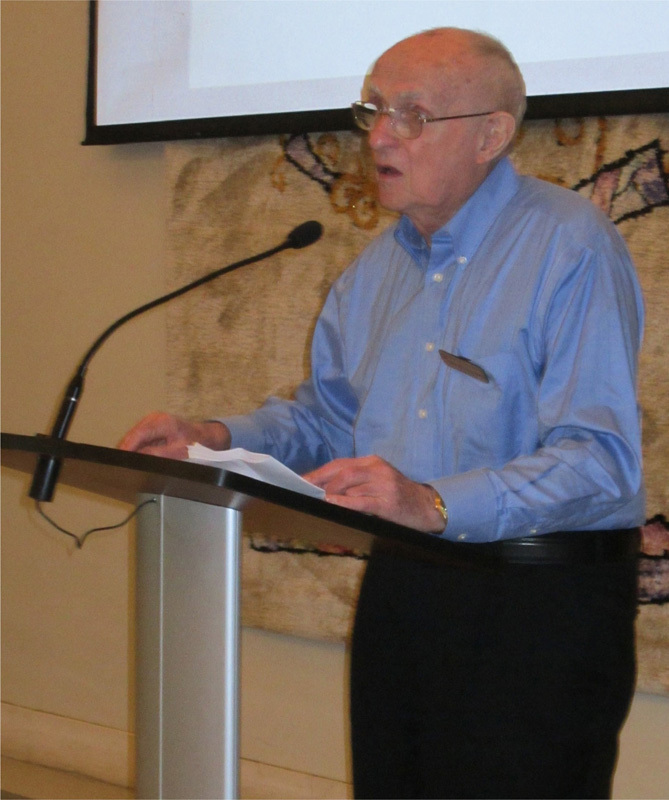 The recent Daytimers program featured Julian Haber and his program, “Jewish American Military Heroes You Never Heard Of.” The program was highly moving and concluded with Haber naming local individuals who received medals for valor during times of war. Two World War II veterans in attendance — Irwin Gratch and Arthur Hofstein — were honored for their bravery and sacrifice in serving our nation. Next on tap for the Daytimers is a Wednesday, Dec. 12 trip to The Legacy at Willow Bend in Plano, courtesy of Legacy resident (and long-time Fort Worthian) Harold Winston. Legacy will provide transportation, leaving Beth-El Congregation (4900 Briarhaven in Fort Worth) at 10 a.m., along with lunch and a Chanukah candle lighting. This is a terrific opportunity to visit with former Fort Worthians, as well as to help spread Chanukah cheer among Legacy residents. For information about this upcoming trip, or to make a reservation, contact Barbara Rubin at 817-927-2736. We continue this week with our correspondence with the singer Matisyahu. I think my No. 1 question during the decade I was ultra-orthodox was as follows: How can we claim that we were chosen by God to be his special nation without saying it’s a racist idea? Conceptually, how is this any different from Hitler saying the Germans are the pure race or any other race or religion claiming they are the “special ones.” Granted, we are not out there murdering those who don’t believe as we do. However, it seems impossible to claim that we don’t see ourselves as better. I never felt comfortable with this concept and never got a satisfactory answer. Let us consider a light bulb. A light bulb is a receptacle for electric energy used to provide illumination. Multiple sizes and types of light bulbs are available based on the use one intends for it. If you want a dim nightlight for your hallway or bathroom, you don’t need a very big bulb; it doesn’t need to receive so much energy, as you don’t intend to cast much illumination with it. If you intend to light up your living room, you need a larger receptacle for the greater energy needed. An even larger one is necessary to light up your backyard. Another whole league of bulb is needed if you want to illuminate a football field for a night game. I think it’s fair to say that although all the bulbs mentioned above are of multiple sizes and give off diverse amounts of light, none of them are “better” than the other. As a matter of fact, it would be counter-productive to put a high-intensity flood light in your bathroom. And, needless to say, the nightlight wouldn’t do much in the backyard. Different doesn’t mean better or worse, it just means different. As we find different purposes for light bulbs, we also find different purposes among nations of the world. We believe that every nation, Jewish or gentile, has a divine mission (or missions) to effect in the world — just as we believe that every individual person, Jewish or gentile, has a unique purpose for which he or she was sent to this world. My mentor, the esteemed sage Rav Wolbe, ob’m, once gave a discourse showing which unique lessons are to be learned by a large number of nations and how we, the Jews, learn those lessons during our exile. Then, we will fuse them all together and incorporate them into our broader national consciousness when the ingathering of the exiles is complete at the final Messianic time of our national history. Part of the unique role of the Jewish people is to be a “light among the nations.” This means that it will not do for Jewish souls to illuminate just our immediate surroundings. To be only a nightlight will not suffice. When God gave us the Torah at Sinai, He intended it to be an instruction manual for all of mankind. This does not mean everyone needs to be Jewish; on the contrary, that would detract from each nation’s individual role. There are, however, lessons in the Torah how the gentile nations should conduct themselves under the rule of God. It is incumbent upon the one nation to which the Torah was given directly, the Jewish people, to be that high-intensity floodlight so they can be a “light among the nations” — to conduct themselves in an exemplary way. That will make them a role model for the entire world; they will teach what it means to live with a relationship with God. As we see, to be a “chosen nation” is a lot more about a higher level of responsibility than it is about being “better.” (And, for better or worse, the Torah also outlines in no uncertain terms about what is coming to us if and when we don’t fulfill that responsibility, as we have experienced throughout our Diaspora history). At Sinai, we were endowed with the expanded souls necessary to be a receptacle for all that spiritual energy; we continue to receive it through the Torah for all time. May we live up to our responsibilities and truly serve as an inspiration for all of mankind. I gave thanks for lots of things at our family’s Thanksgiving table last week. But in addition to all of the usual, I added some special gratitude for those of the family at other tables in other places, the ones who take the time and trouble to send me clippings from the newspapers (yes; still two dailies.) in my old hometown. How often I learn things that I haven’t yet heard of here. Gita Taitz, Sonia’s mother, might have had a career as a concert pianist in Lithuania, but she was expelled from music school right before graduation when the Nazis came, and interned in a camp instead. Simon Taitz, her father, owed his life to his pre-war career: At Dachau, the Nazis — always so notorious for precision in record-keeping — needed his skill to keep their watches and clocks running on time. The two met much later in New York City at an event for survivors. Marylynne Pitz, who wrote about Taitz’s book in a recent issue of the Pittsburgh Post-Gazette, interviewed the author to find out how it had come to be and learned this: One day, Gina Taitz gave her daughter a story, written by hand in an immigrant’s English on lined notebook paper — that, was her tale of survival. On the day of liberation, the Nazis went through the camp’s barracks, killing everyone by injection so there could be no later testimony against them. Gina survived by hiding among the dying women, and thus avoided the fatal needle herself. But Sonia Taitz waited until both her parents had actually passed away before writing about them: “When someone dies, you see a beginning, a middle and end to their life. I couldn’t see them that objectively until they were gone.” I gave thanks for her book. I also gave thanks this year for the life and legacy of Wilhelm Brasse, another who survived because the Nazis needed his skill, who only recently passed away at age 95 in his native Poland. A non-Jewish political internee, he was sent to Auschwitz for trying to leave the country illegally after Germany took it over in the spring of 1940. There, because of his professional behind-the-camera experience in Krakow, he was assigned to take identity photos of camp newcomers. He has not been officially recognized as a Righteous Gentile since he never actually saved any Jews, but he preserved many forever by saving their photos, in defiance of Nazi orders for destruction when the camp’s liberation became imminent. These are the stripe-shirted “mug shots” now viewed by visitors to the camp, the ones I saw last spring during my tour of Auschwitz. As we get farther and farther away in time from the Holocaust, more and more is being told about it. More and more once-hidden stories are finally coming into the light; more and more books and photos and films are putting ugly realities, and accompanying tales of heroism and miracles, before the general public. In the same issue of the Post-Gazette that featured both the story behind Sonia Taitz’s “Watchmaker’s Daughter” and the obituary of Wilhelm Brasse, there was a review of “La Rafle,” France’s much delayed on-screen telling of its 1942 roundup of Paris Jews, most of whom went on to meet the end of their lives at Auschwitz — perhaps after having their photos taken there. Too many people still tell me they’re tired of the Holocaust and don’t want to know any more about it. I gave thanks at Thanksgiving this year for the many who ignore them and keep on producing art from horrific history, helping to assure that it will never be repeated. Hopefully you are reading this over Thanksgiving, surrounded by family and friends. It is the perfect time to talk about family values. Today we are looking for the quick answer — the brand … the vision … the jingle — that will tell us how to live our lives. The rabbis ask, “What is the most important verse in the whole Torah?” Each had a different answer. Ben Azzai said the most important verse in the Torah is, “This book is the family history of Adam” (Genesis 5:1). Rabbi Akiva said the most important verse is, “You shall love your neighbor as yourself” (Leviticus 19:18). Rabbi Tanhuma added, “In the image of God were people created” (Genesis 1:27). Was there a winner? Which one speaks to you? Recently, the Aaron Family JCC staff looked at 20-plus Jewish values and had a similar discussion and debate. We aren’t rabbis, but we were looking at what values represent us at the J and what values we personally live by. The discussion was wonderful — in fact, it is the discussion that is often more important than the decision. Here is a list of “Jewish Values.” Put them on cards and together with your family (or the people you work with) and pick the three that will serve as guiding principles in your lives. Remember, there is no wrong answer. Tzelem Elohim — Image of God. Hakhnasat orchim — Welcoming guests. Shem tov — A good name. Sayver Panim yafot — Greeting everyone with a pleasant face. Now after you have chosen your “family values,” take the next step: What does each value look like? How do we act to show respect? What does it mean that we have a welcoming home? What do we do to achieve a good name? Judaism takes the big picture and makes it action-based — if we can’t do it, how will we or anyone else know that this is what we stand for? Enjoy the conversations. And perhaps even make a family T-shirt. Laura Seymour is director of Jewish life and learning and director of camping services at the Aaron Family Jewish Community Center of Dallas. She begins by asking: “Do you remember any of these guys?” and follows with the names of 29 sterling, stalwart Jewish comedians who once cavorted on Catskill stages. Remember them? Who could forget them? From Red Buttons to Sid Caesar, from Buddy Hackett to Woody Allen, from George Jessel to Shelley Berman and Phil Silvers to Gene Wilder — they’re almost all here. Then, on an unfunny note, she quotes Shalom Dov Ber Schneersohn, the beloved fifth rebbe of Chabad Lubavitch: “Better one deed than a thousand sighs.” As I told you: my Catholic Gallimaufry Lady has never forgotten her Jewish heritage from our long-ago neighborhood. You never know when a word you say, or something you might do may open up the windows of a mind that seeks a light. Stay off of your thighs. My thoughts this week turned to a very serious note as I contemplated our upcoming Thanksgiving holiday and how to appropriately express my concern for our fellow Jews in Israel while we celebrate the most American of holidays. Each year at our table, in addition to saying the Shechiyanu, I always make a point to lead our guests in “A Prayer for our Country,” which is recited in many synagogues on Shabbat. It begins, “Our God and God of our ancestors: We ask Your blessings for our country — for its government, for its leaders and advisers and for all who exercise just and rightful authority. I never take lightly how fortunate we are to be able to practice our religion freely while being full members of American society. This year, I believe we’ll add, “A prayer for the State of Israel.” As once again, Israel is embattled and forced to defend itself, I want my children and our guests to remember, especially on Thanksgiving, that we owe our ability to live free as Jews in the United States in part because our fellow Jews in Israel who are willing to stand up and protect the Jewish homeland at all costs. If you received this after Thanksgiving, perhaps you can add it to the Shabbat table repertoire. We wish everyone a meaningful and peaceful Thanksgiving. Morton Lewis’ stand-up cause was recently changed from Susan G. Komen to Scottish Rite Hospital. 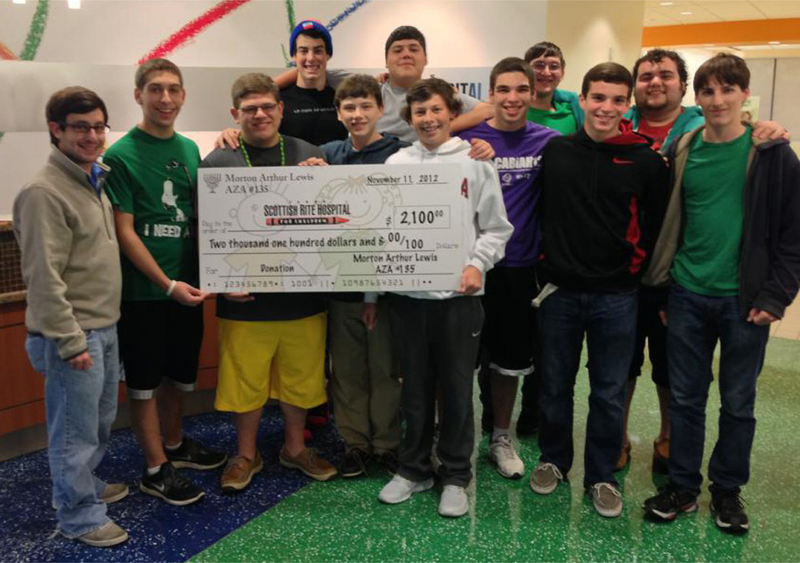 It came to the attention of the chapter, that several of its members were patients at Scottish Rite. At its annual dance in September, Morton Lewis AZA raised $2,100, and attracted the official Cowboys DJ to help put the fundraiser over the top. Thanks to Kelly Glasscock from Scottish Rite, Morton Lewis members were able to obtain a full tour and see where the donation money went. Michael Viver is godol of Lewis and Brandon Cotter is gizbor. Mazel tov to Deborah Niederman, a regional educator for the Union for Reform Judaism, who has been elected president of the National Association of Temple Educators for a term running from July 1, 2013 to June 30, 2015. Debbie and her slate of executives and board members will be formally installed during NATE’s North American Conference, to be held Dec. 23-26 in Phoenix. Deborah steps up from her current position as NATE’s vice president. The new NATE board will include Debbie Massarano, Temple Shalom’s director of lifelong learning, as a first-time member. Niederman serves as the coordinator of Induction and Retention for the Jim Joseph Education Initiative of Hebrew Union College-Jewish Institute of Religion, and the HUC-JIR Schools of Education Alumni Engagement Coordinator. She has been in the field of Jewish Education for 20 years, serving congregations in New Jersey, Florida and Ohio. In addition to serving as a congregational educator, she also worked for the Union for Reform Judaism for nearly 10 years. She has devoted much of her career to mentoring new colleagues in the field, curriculum development, building leadership and change capacity and professional development. Debbie devotes a great deal of time to supporting Jewish education as a volunteer. In addition to her efforts on behalf of the National Association of Temple Educators, she has served on the advisory board of the Center for Jewish Education here in Dallas for the past six years and currently chairs the Strategic Planning Committee and the Community of Educators Committee. Debbie lives here in Dallas with her husband, Rabbi Andrew Paley, and their two children, Molly and Sammy. She is a 1990 graduate of Washington University in St. Louis and a 1993 graduate of the Rhea Hirsch School of Education at HUC-JIR in LA. Congregation Shearith Israel is offering two Hebrew classes beginning next week. In Advanced Hebrew, you can further your Hebrew with Dina Eliezer, Weitzman Family Religious School director. This class will run from 6:30-7:30 p.m. Mondays. A strong reading foundation is needed. The second class Dina is teaching is Ivrit b’Ivrit and will meet 7:40-8:40 p.m. This class will be conversation based in and spoken exclusively in Hebrew. 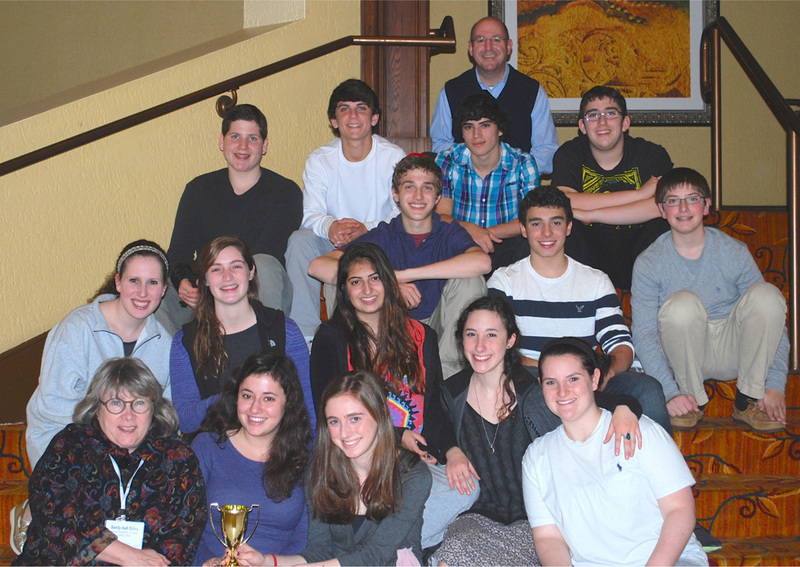 Many students from the first class are also attending the second class to “immerse” themselves in Hebrew. Shearith Israel is also beginning a Yiddish class, 10:30 a.m.-noon Wednesdays starting Nov. 28. The Yiddish class is an exciting venture for Shearith Israel. For years, Shearith has had a fun conversational class but never a proper how to speak, write and read the beloved Mamaloshen. There is a nominal charge, and all interested are encouraged to contact Mona Allen at 214-939-7318 for more information and to sign up. Yavneh’s 2012 Stuffed Animal Drive is under way, and the students of Kids Korner hope to surpass the 103 stuffed loves they collected last year. Donations will be shared with the patients of Medical City Children’s Hospital. Donate new stuffed pals to the Kids Korner box in the Yavneh’s Main Office thru Dec. 5. Yavneh Academy is located at 12324 Merit Drive Dallas 75251. For information, call 214-295-3500 or visit yavnehdallas.org. As you read this issue, you’ll either be celebrating Thanksgiving, or chowing down on leftovers the day (or two) afterward. It all depends on when you receive this publication. At any rate, Thanksgiving gives us a wonderful opportunity to truly appreciate what’s good in our lives, even as we’re facing yet another day of leftover turkey. The gratitude in that is, however, that we actually have turkey on which to dine (and from which to make leftovers). There are those who would be highly grateful for leftover anything. So as we get together with friends, relatives and loved ones during this season of thanks, let’s express our gratitude to Hashem for the good things in our lives. Let’s also remember those who are less fortunate — and let’s take action, whether that action involves serving food at a soup kitchen, donating blood or filling the tzedakah box. We also need to pray for Israel’s safety during these difficult times. Have a wonderful holiday, replete with love, laughter and friendship. While you’re enjoying Thanksgiving with friends and family, take a couple of minutes to mark the evening of Saturday, Dec. 8 on your calendar. Beginning at 7 p.m., Congregation Ahavath Sholom will host a communitywide, first-night-of-Chanukah event that should, to mention a cliché, knock your socks off. Politicos will be on hand as honorary candle lighters — Fort Worth mayor Betsy Price is one of those who expected to be on hand. The CAS children’s choir will perform, the shul will be recognized for its Clean for Quarters program, and the entertainment comes courtesy of Lucky Break. Lucky Break is — wait for it — a Jewish bluegrass band from Milwaukee located by Michal Bloom, wife of CAS’ rabbi Andrew Bloom. I ran into the Blooms at the recent Fort Worth Hadassah event and was told that Michal loves bluegrass. As an aside, I was at last year’s CAS Chanukah event and it was packed — wall-to-wall people. Rabbi Bloom told me that this year’s is liable to attract even more folks, so it should be a lot of fun and a great way to honor the first night of this holiday. And yes, we’ll be there, too. … Winter Camp, courtesy of Camp Gan Israel of Fort Worth (hosted by Chabad of Fort Worth and Tarrant County; 5659 Woodway Dr.). The camp will take place Dec. 24-28 and is geared for children ages 5-12. Cost is $140 for the full week or $35 per day. For more information (or to register), log onto www.chabadfortworth.com. And speaking of Chabad of Fort Worth, a hearty congratulations goes out to Rabbi Dov Mandel for completing the addition on the building on Woodway Drive. The addition provides greater room for services and educational opportunities (and it looks great, by the way). Congregation Beth Israel in Colleyville is introducing something kind of neat — several times during the next few months, the synagogue, located at 6100 Pleasant Run Road, will provide dinner and a local guest speaker in conjunction with Wednesday night minyan prayers. Dinner is served at 6 p.m., followed by the evening service at 7 p.m. The guest speaker will then be on tap from 7:30-8:45 p.m.
Upcoming guests will include Ron Bernstein, southwest emissary with the Jewish National Fund Israel (look for him on Jan. 9, 2013) and Rabbi Geoffrey Dennis of Kol Ami in Flower Mound, who is scheduled for Feb. 6, 2013. The program is funded by the Jewish Federation of Fort Worth and Tarrant County, and looks to be very interesting. There doesn’t seem to be a cost for these dinners, but for more information (and to RSVP), email administration@congregationbethisrael.org. … not to mention somewhat awkward written segues, Congregation Beth Israel’s next blood drive will take place Sunday, Jan. 6. I don’t have the details yet, but I do plan to attend once again, and this time I will not drink coffee before donating blood. Apparently caffeine lowers one’s iron levels, and speaking from personal experience, when that happens, you don’t get to donate. Last one. I promise. The Jewish Federation of Fort Worth and Tarrant County will honor four generations of the E.M. and Rosalyn G. Rosenthal Family at a special celebration, taking place Sunday, Jan. 27, 2013 at the Modern Art Museum of Fort Worth. As part of the celebration, the federation will present a “Legacy of Giving” tribute book to the Rosenthal family. Many of you may have received emails about this, but if not, contact the federation for more information by calling 817-569-0895 or visit www.tarrantfederation.org. One thing I’m very thankful for is the personal news coming out of the Tarrant County Jewish community. I love posting positive happenings, from accolades, to family and friend get-togethers. We’re coming up on a very happy time, between Thanksgiving and Chanukah. I’d love to receive information about parties and gatherings, as well as photos of holiday fun. My email address is the same — awsorter@yahoo.com. I’ll look forward to hearing from you.